Recently, a viral video circulated throughout multiple social media platforms. The video features a giant figure of the Blessed Virgin Mary floating down a street due to flooding. “Our Lady strolling through a flood? In the Canary Islands, devotion to Our Lady of Candelaria is very traditional and the whole city is decorated to celebrate the feast in honor of Mary Most Holy. “But as a result of the heavy rains, one of the images was unveiled and “wandered” by the rain. “Every February 2 and August 15 thousands of pilgrims from all parts of the Canary Islands and other parts of Spain go on pilgrimage to the shrine to celebrate the feast in honor of the patron saint of the Canary Islands. “In February highlights the Procession of the Candles and August the Staging of the Apparition of the Virgin. “In our lives too, in the midst of storms and floods, our Mother is always present. We actually found an identical video featuring the same instance, except it isn’t the Blessed Virgin Mary floating down the street! 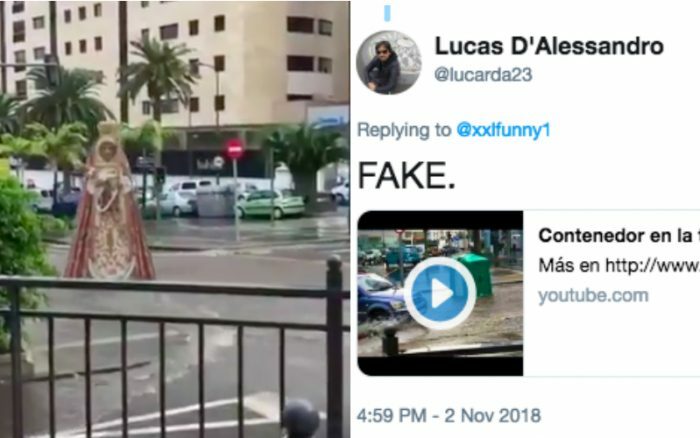 In response to this tweet with the video of the Virgin Mary floating down the street, this person said, “FAKE,” and posted the video below. If you compare the two videos, you can see that the one above is the original, and the one with the Virgin Mary is doctored. But the post on Instagram is right–the video is still cute!